the benefits are far greater than just physical health. whole child, from the inside out. The YMCA is dedicated to providing a quality tumbling program where new tumblers learn the basics and experienced tumblers improve their skills. We will hold 2 six-week sessions. All classes are limited and each class will be 45 minutes long unless stated otherwise. Tumble Teenies: There is no prior experience or skill level required for this class, as it will provide a comprehensive basic tumbling education. Teenies will be introduced to body positions, balance, rolling, and more. 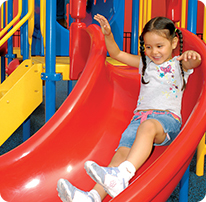 An experience class for preschoolers to explore the world of movement in a fun and safe environment. Ages 3-5. Level 1: Level 1 students do not have a skill list of prerequisites. Tumblers will be expected to be able to listen and follow directions. In level 1, a tumbler will build the foundation for their gymnastics career with an introduction to basic skills such as rolls, cartwheels and handstands. Level 2: Level 2 is a technique-geared class. This class is designed to help students complete basic skills with correct form and without help from the teacher. Tumblers in this class should have completed forward and backward rolls, be able to attempt a cartwheel and a handstand before entering class. In addition to perfecting technique, tumblers will be introduced to new body positions such as bridges and hollows. Days & Times: Tumble Tots (Parent & Child): Tuesday at 4:00 p.m.
Tumble Teenies: Tuesday at 4:30 p.m.
Tumble Teenies: Wednesday at 4:00 p.m.
Level 1: Monday at 5:00 p.m.
Level 1: Wednesday at 4:45 p.m.
Level 2: Monday at 5:45 p.m.
Level 3/4: Wednesday at 5:30 p.m.
Come enjoy youth basketball! Each team will practice once during the week at the coach’s discretion and play once on Saturdays. Players will be divided based on grade. This season will last for six weeks. Coach's Meeting: Thursday, January 24 at 6:30 p.m.
Meet the Coach Night: Thursday, January 24 at 7:00 p.m. Learn the basics of soccer in an imaginative and exciting way. Children will develop coordination, balance and those all important social skills. Your first timers will leave feeling like all-stars! We will hold 2 four week sessions. Pre-Registration is required. It’s time for soccer once again! Players will be divided based on grade. Each team will practice once during the week at the coach’s discretion and play once on Saturdays. This season will last for six weeks. 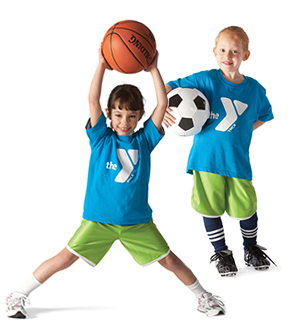 Soccer is our fastest growing program here at the Y and the biggest sport in the world. In order to meet the ever increasing demand we are always on the lookout for volunteer coaches. If you are interested in coaching a team please let our program director Luke know. Your support is very much appreciated. Participants must be 4 years old by the program start date, Monday, March 25. 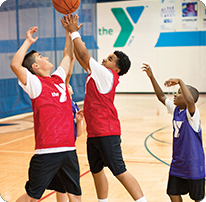 Coach's Meeting: Thursday, March 21 at 6:30 p.m.
Meet the Coach Night: Thursday, March 21 at 7:00 p.m.
Private/Semi Private lessons are available for members by appointment only. 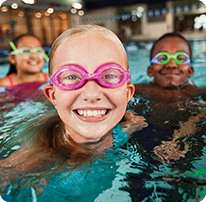 Lessons are available for the following: Tumbling, Soccer, Basketball and Football. Minimum age is four years old.